Bulgaria again ranks bottom in the European Union’s 2013 scoreboard of innovation performance, having been at or near the lowest ranking every year since 2008. Bulgaria now has ranked last in the 2008, 2012 and 2013 scoreboard, placing second-bottom in 2009 and fourth from last in 2010 and 2011. In the years that Bulgaria was not awarded bottom spot, that place went to Turkey, not an EU member state even though the ranking is billed as being of EU member states. 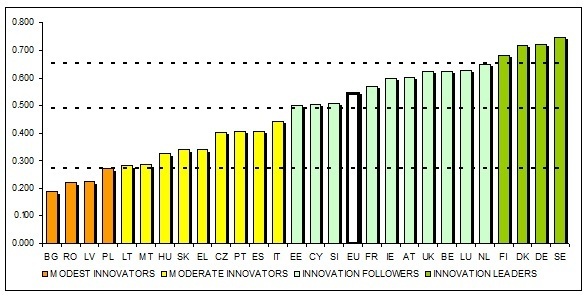 The 2013 European Commission Innovation Union Scoreboard also shows a widening “innovation divide” as the most innovative countries improve their performance while others, in the words of the European Commission, “have shown a lack of progress”. Innovation performance in the EU has improved year on year in spite of the continuing economic crisis, but the innovation divide between member states is widening, the EC said on March 26 2013. The overall ranking within the EU remains relatively stable, with Sweden at the top, followed by Germany, Denmark and Finland. Estonia, Lithuania and Latvia are the countries that have most improved since last year. Drivers of innovation growth in the EU include SMEs and the commercialisation of innovations, together with excellent research systems. However the fall in business and venture capital investment over the years 2008-2012 has negatively influenced innovation performance, the EC said. “Outputs” which show how this translates into benefits for the economy as a whole (innovators and economic effects, including employment).